The total does not include a $3 per ticket service charge. Celebrating what would have been George Harrison’s 75th year, The Dark Horses, a powerhouse line-up of nine Orange County musicians, bring to life Harrison’s musical legacy from his Cavern Club days with the Beatles through his solo career, including collaborations with Eric Clapton, Jeff Lynne, and The Traveling Wilburys. The stories behind the music form a narrative that connects the music to a generation for which Harrison’s music was a soundtrack, while creating context for a newer musical generation. 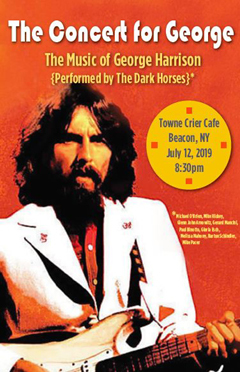 The Dark Horses are Michael O'Brien (guitar, vocals), Gerard Mancini (guitar), Paul Binotto (bass, vocals), Glenn John Arnowitz (keys, vocals), Gloria Esch (vocals), Melissa Mahony (vocals), Barton Schindler (tenor sax), Mike Pacer (alto/baritone sax).